Vegans Can Throw a Party! Last Friday night my husband and I threw our first party since moving to LA (and in all honesty, our first party in about 5 years). I never had much luck with being a party host, or maybe I’m just too critical of myself, but needless to say I was stressing a bit for the past week or so. The theme of our party was Ugly Sweaters, so everyone was supposed to come in the ugliest sweater they could find. I wanted to make sure there was enough food for everyone to munch on and even though none of my friends in attendance are vegan, I wasn’t planning on serving anything that wasn’t. Being that we were just having snacks, it was pretty easy to do: chips, salsa, guac, etc. I did want to make a couple of special items though to nonchalantly show that vegan party food could be yummy too! Let me go back for a minute to around Christmas time, when I discovered the most wonderful invention ever known to man: cookie butter (speculoos). Trader Joe’s had their version and I was lucky enough to score a jar before the entire company sold out of it. I was hooked at first bite. I knew immediately that I needed to make a cupcake frosting out of it. Fast forward back to present day. For the party I decided to make mini Golden Cupcakes from Vegan Cupcakes Take Over the World. I added a teaspoon of cinnamon to the mix to give them a little added spice to compliment the cookie butter frosting. Then I used the peanut buttercream frosting recipe from the same book but substituted cookie butter for peanut butter. It turned out AWESOME, but it tasted a lot like maple so I think next time I’ll leave out the molasses. The combo was still amazing and everyone loved them! The next little surprise up my sleeve was vegan jello shots! I found a recipe online, but I wasn’t happy with how they turned out, so I tweaked it until they came out exactly how I wanted them. I’ll post the recipe separately in a few days, so keep your eyes out! They were a definite hit. 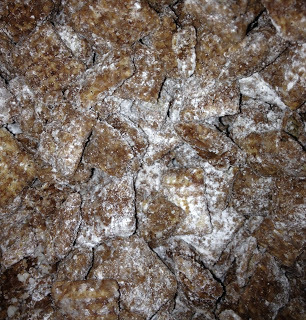 The last vegan bowl of yum we served was what my good friend Lynn called “puppy chow”. 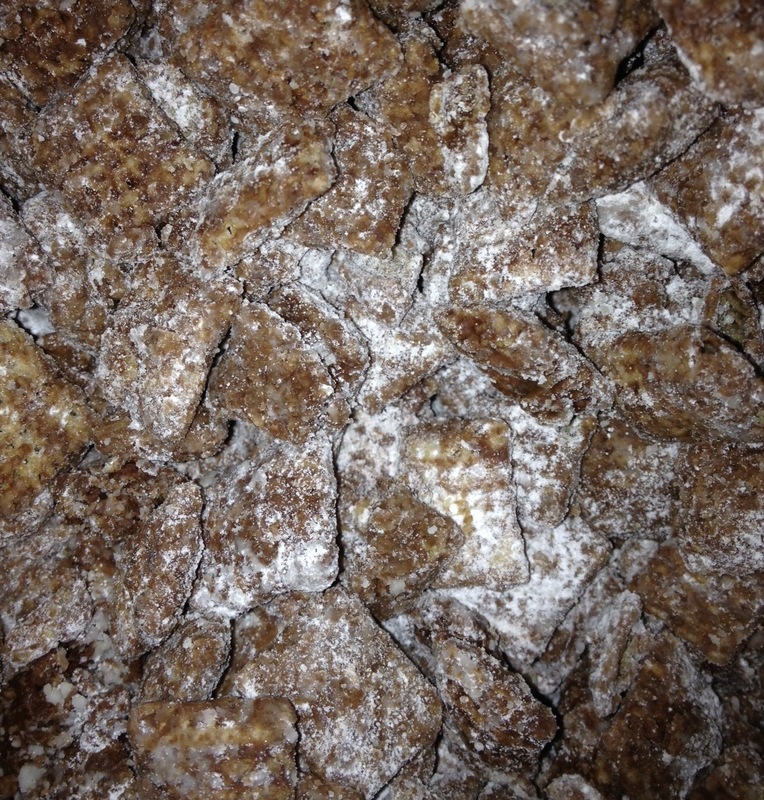 For those not in the know (which was me until Friday), it’s basically rice Chex, chocolate, peanut butter and powdered sugar all melted and tossed together to create a delicious flavorgasm. She was nice enough to use my bag of vegan chocolate chips so I could enjoy it as well. And the winner of the ugliest sweater was this gem – hideous indeed! It is hanging in our living room and my husband insists on leaving it there until our 2nd Annual Ugly Sweater Party….I’m not so sure about that! Overall it was a super fun night filled with amazing friends, good tunes and delicious vegan snacks! ROCK ON!